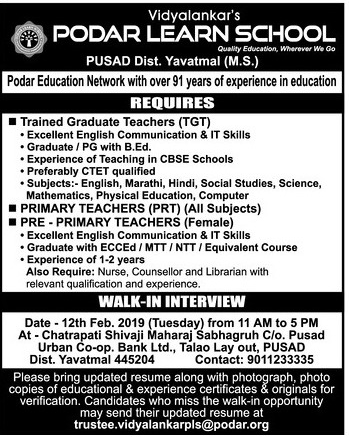 Podar Learn School, Yavatmal has advertised in LOKMAT newspaper for the recruitment of Teachers TGT / PRT / PPRT jobs vacancies. Interested and eligible job aspirants are requested to walk-in on 12th February 2019. Check out further more details below. About School : Established in 1927, by Sheth Anandilal Podar, Podar Education Group has, from the very beginning been focussed driven and motivated by the traditional Indian values of honesty, integrity and service. The father of our nation, Mahatma Gandhi, being the very first President of the Anandilal Podar Trust stands testimony to this fact. (View the minutes of the first Trust meeting). Salary: As per School norms. How to Apply: Interested and eligible candidates are requested to attend the Walk-in interview along with updated resume, photograph, copies of educational & experience certificates & originals for verification. Candidates who can't attend interview may send their resume to the email address provided below.